They wanted her body. She wanted their blood. Training Camp Soldier: I want to kill people. The lack of professionalism and logic (to mention just one example: how and when the hell did the heroine remove the bullets from the gun at the end?) 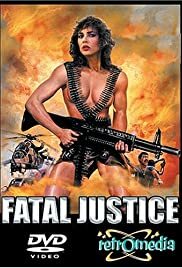 in "Fatal Justice" is good for some unintentional amusement, but most of the time the film simply alternates between boring drawn-out non-action scenes, poorly done action scenes, and stolen action scenes. By "stolen", I mean that it's pretty clear that most of them (especially those involving vehicles) were taken from other films and patched onto this one! You can even see the difference in the (more grainy) film stock. Suzanne Ager is OK, Joe Estevez overacts (it would be SO easy to mistake him for his brother, Martin Sheen, if it weren't for their difference in acting skills! ), and most of the rest of the cast is obviously made up by amateurs. It's been said before, but it's true: the cover is better than the movie. *1/2 out of 4.